Viva Venezuela: Fighting for Socialism - now live online! Feature length documentary . . . watch in full . . . share . . . circulate. . . In October 2012 Venezuela faced a choice: whether to deepen the Bolivarian Revolution that under the leadership of Hugo Chavez, has brought dignity, health, education and hope - or to return to a brutal, unequal, neo-liberal society where oil wealth lined the pockets of multinational companies and Venezuelan elite. The people of Venezuela who voted for Chavez, voted to fight for socialism. The Revolutionary Communist Group was on the streets of Caracas throughout the presidential elections in October 2012. We joined hundreds of thousands as they thronged the city, braving torrential rain or baking sun, to express their support . This film takes you on that journey, through the barrios, universities and workplaces to meet the political activists, students and workers who are changing their future. 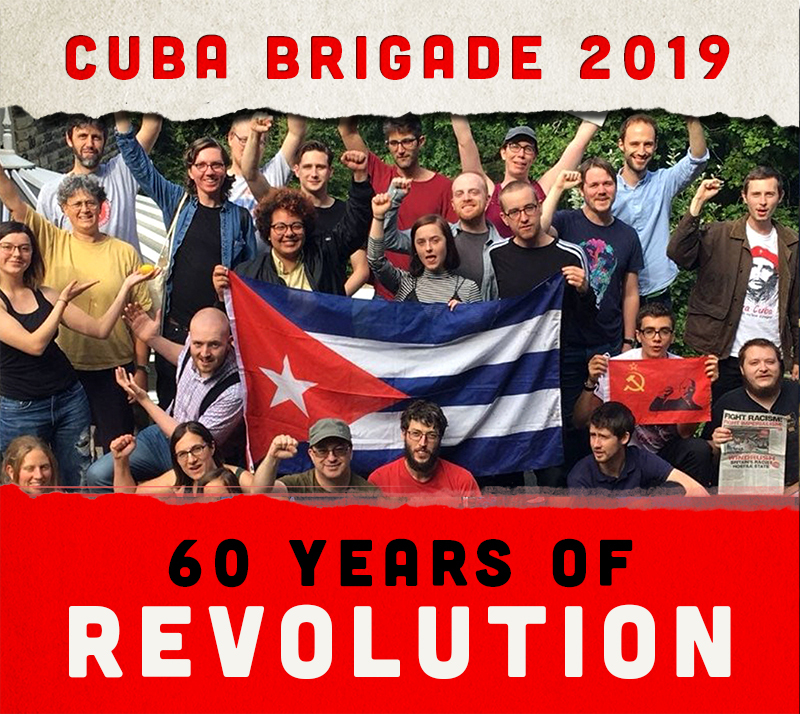 The film premièred in London on 25 October where 150 people packed out Bolivar Hall to hear speakers from the RCG, the Venezuelan and Cuban embassy discuss the movement in Latin America and its relevance to the struggle here in imperialist Britain. It continues to screen all around the country, picking up momentum, not only increasing our understanding of the struggle in Venezuela, but helping us understand the tasks that face us here in Britain. 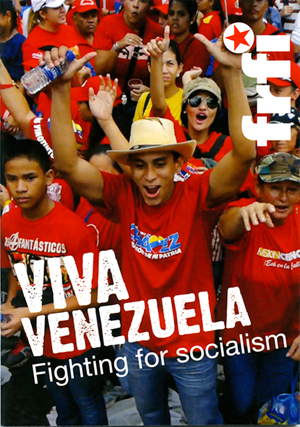 Our solidarity with the struggle for socialism takes this form – publicising the example of the Bolivarian Revolution and through films, articles and leaflets; bringing the message to the streets as we struggle against capitalist cuts, the parasitic banking system, imperialist war and occupation here in Britain, the belly of the beast. As our new documentary 'Viva Venezuela: Fighting for Socialism' launches live online we are pleased to announce new upcoming showings. 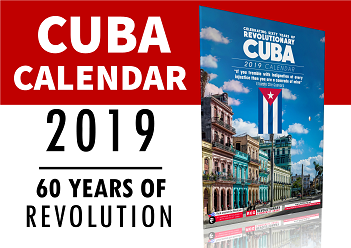 The film premièred in London on 25 October where 150 people packed out Bolivar Hall to hear speakers from the RCG, the Venezuelan and Cuban embassy discuss the movement in Latin America and its relevance to the struggle here in imperialist Britain. It continues to screen all around the country, picking up momentum, not only increasing our understanding of the struggle in Venezuela, but helping us understand the tasks that face us here in Britain. Thursday 28 November 7pm Brixton soup kitchen and support centre. During the past few months, the Venezuelan government led by President Nicolas Maduro has denounced multiple incidents of sabotage against the country’s electrical infrastructure along with an ongoing campaign to undermine the nation’s economy. A majority of international media, together with private media in Venezuela, have ridiculed the Venezuelan President’s accusations, and have instead attempted to pin responsibility on the government for the instability and harm caused to the country by these actions. Nevertheless, an internal document authored by three organizations from Colombia and the United States, evidences a sinister plan against the Venezuelan state to provoke violence – even death – with the intention of justifying an international intervention in anticipation of municipal elections scheduled for next December 8. The document, titled “Strategic Venezuelan Plan”, was prepared by the Democratic Internationalism Foundation (http://fidauv.org), headed by ex Colombian president Alvaro Uribe, together with the First Colombia Think Tank (http://www.pensamientocolombia.org) and the US Consulting firm, FTI Consulting (http://www.fticonsulting.com). Dated June 13, 2013, the plan was developed during a meeting between representatives from these three organizations, leaders of the Venezuelan opposicion, including Maria Corina Machado, Julio Borges and Ramon Guillermo Avelado, expert in psychological operations J.J. Rendon and the Director of the US Agency for International Development (USAID) for Latin America, Mark Feierstein. For more than a decade people opposed to the government of Venezuela have argued that its economy would implode. Like communists in the 1930s rooting for the final crisis of capitalism, they saw economic collapse just around the corner. How frustrating it has been for them to witness only two recessions: one directly caused by the opposition's oil strike (December 2002-May 2003) and one brought on by the world recession (2009 and the first half of 2010). However, the government got control of the national oil company in 2003, and the whole decade's economic performance turned out quite well, with average annual growth of real income per person of 2.7% and poverty reduced by over half, and large gains for the majority in employment, access to health care, pensions and education. Now Venezuela is facing economic problems that are warming the cockles of the haters' hearts. We see the bad news every day: consumer prices up 49% over the last year; a black market where the dollar fetches seven times the official rate; shortages of consumer goods from milk to toilet paper; the economy slowing; central bank reserves falling. Will those who cried wolf for so long finally see their dreams come true? 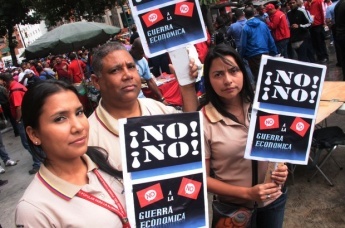 Pro-government trade unions marched last week against Venezuela’s main business federation to protest the “economic war” that workers argue the federation is waging against the government. The march, which took place last Thursday in the capital Caracas, was directed at Venezuela’s largest business federation, Fedecamaras, as well as the Venezuelan – American Chamber of Commerce and Industry (Venacham) and the National Council of Commerce and Services (Consecomercio). Several trade unions in favour of the government of Nicolas Maduro participated in the march which was led by the Bolivarian Central of Socialist Workers, the main pro-government union federation. The march, which arrived at Fedecamaras’ offices in central Caracas, was held to show worker opposition to the “economic war” and rally support for the government’s economic policies. 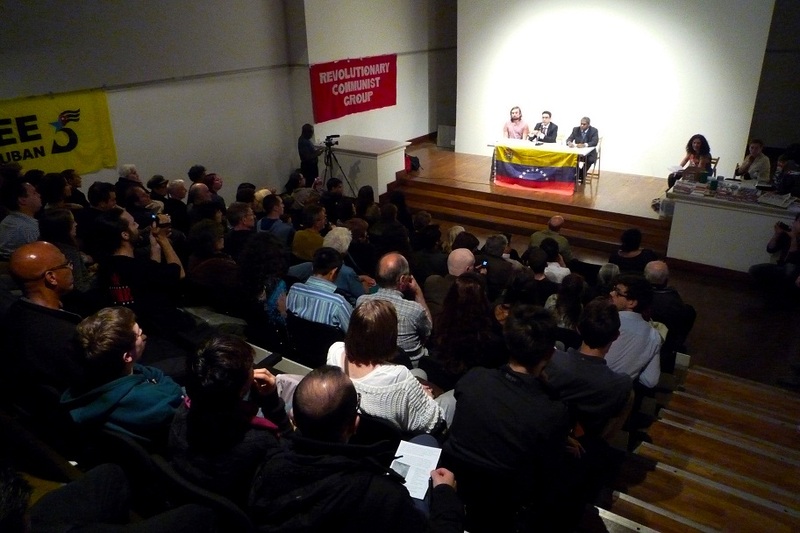 On Friday 25 October 160 people packed into Bolivar Hall, the cultural venue of the Venezuelan Embassy, for the London premiere of Viva Venezuela - Fighting for Socialism, a new film produced by the Revolutionary communist Group. Filmed during the RCG’s delegation to Venezuela during the October 2012 presidential elections, Viva Venezuela tells the story of the struggle to build socialism in Venezuela through interviews with Venezuelans at the grassroots level. 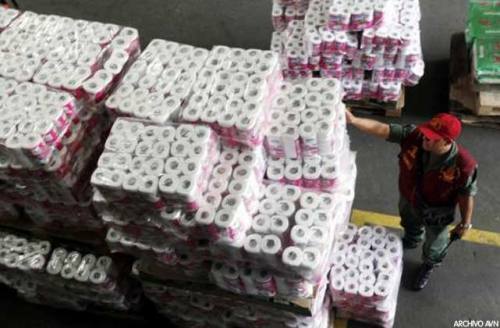 The corporate media in the United States and Europe are fond of reporting "shortages" of essential goods available to the public in Venezuela. It seems that one of their favorite items for such reporting is bathroom tissue with the expectation that this will evoke some sort of an infantile "embarrassment" factor among their readers and TV audiences. . 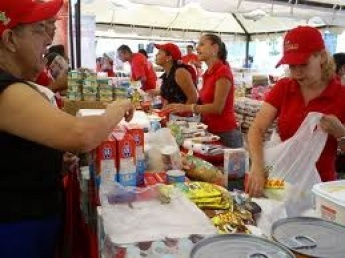 The US-backed opposition in Venezuela either hoards or destroys many tons of products in order to keep them off the retail market thus creating the perception of "shortages" and inadequate production with a socialist government in power. The goods that are hoarded and destroyed are almost always items under price controls, thus denying affordable purchases by people with lower incomes. These forms of sabotage are done by the private manufacturers, private food processing plants, private distributors and by the private supermarkets themselves. The masses of Venezuela are fighting to free themselves from the crisis of capitalism and the stranglehold of US imperialism. 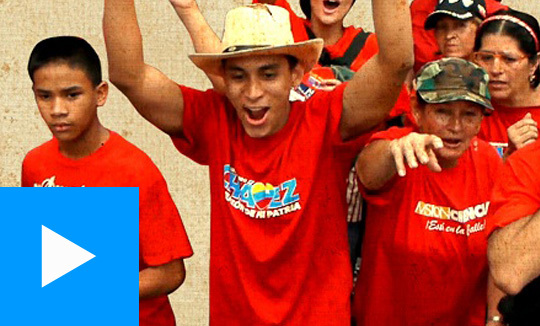 Millions stand united, formerly under the leadership of the late Hugo Chavez and now Nicolas Maduro, to assert their social, economic and national rights to the ‘good life’ (Buen Vivir). Socialism or death is their call! On Saturday 19 October, a Glasgow audience gathered for the launch of a new documentary from the Revolutionary Communist Group: ‘Viva Venezuela! Fighting For Socialism!’ After listening to a talk on the background history and present struggles faced by the Bolivarian revolution the film was shown. 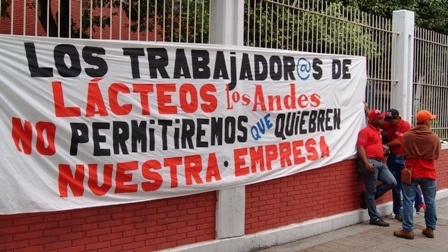 Recent struggles by Venezuelan workers have exposed the opportunism that still exists within the management structures of industry, permeating through nationalised companies, and even the highest levels of government. This point has been illustrated in a series of protests and victories in state food companies throughout July and August. They show that the forward momentum of the Bolivarian Revolution depends on the socialisation of production and the deepening of worker controls throughout the country.